Learn more about Rapid Metals, LLC. 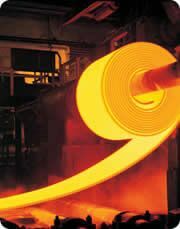 Rapid Metals, LLC is a full service steel and non-ferrous metals distributor based in West Bloomfield, MI. We have been in business since 2004, and through our strategic alliances throughout the Eastern half of the country and Canada, we offer slitting, blanking, pickling, cold reduction, edge conditioning, temper passing and other forms of processing to our customers. We service a wide array of industries which includes tubing, automotive, appliance, agriculture, and racking. We ship steel from Connecticut to Kansas City and from Montreal to Houston. We stock inventory on Hot Rolled and Cold Rolled as well as Galvanized coils to meet the needs of most of our customers. On the Non-Ferrous side we stock Stainless, Aluminum, Copper and Brass coils in various grades. With our mill alliances we can roll steel to your exact specifications and to the highest quality standards offered in today’s market. We pride ourselves on our ability to locate hard-to-find items at reasonable prices and leadtimes. We have an extensive network of service centers and processors who help us accomplish this goal. Contact us today and let us put these resources to work for you and save you the hassles!